Planting intentions for 2016 will draw considerable attention in the coming months. Crop insurance guarantees are one factor which will play into this decision. As we pointed out last year, crop insurance guarantees have fallen considerably in the past two years and barring a rally, guarantee prices are likely to be lower again this year. At current levels, crop insurance will not guarantee revenue sufficient to cover variable costs plus land rents. The relative levels of corn and soybean prices are similar to last year and do not appear to suggest a large shift in acres from last year. The following table shows crop insurance corn price guarantees since 2007. The price column shows the February crop insurance price. The price guarantee for 2016 is not yet set, so it was estimated based on the average of the December 2016 futures price for the first week of February. The next column shows the 80% revenue guarantee for a farm with a 200 bushel per acre actual production history. The variable costs column provides the variable cost estimate for high quality land raising corn under a 50/50 corn-soybean rotation in the Purdue crop budgets. The final “net guarantee” column shows the difference between the revenue guarantee and the estimate of variable costs. The net guarantee is what is guaranteed to be available to service the fixed costs of the farm. Today’s net guarantee level is the third lowest in the table, but for all practical purposes is basically the same as observed in 2009 and 2015. We have used a single asterisk to identify each year in which the net guarantee was sufficient to cover today’s estimated land rent of $269 per acre. It is not uncommon for the net guarantee to be as large as the cash rent on the farm. There are 10 different crop years shown in the table and the net guarantee would have covered today’s cash rent in 7 of those years. Currently, it falls short by $64 per acre. Purdue estimates that the fixed costs and land rent on such a farm would average near $480 per acre. This means that the guarantee currently falls $270 per acre short of covering the fixed costs of the farm. This amount will need to come from a) bushels of corn above the 80% guarantee, b) prices received for corn sold above the guarantee level, or c) some combination of the two. It is not uncommon that the net revenue guarantee would fall short of covering all of the fixed costs of the farm. In fact it is very uncommon that it would! In only one instance shown in the table (2011) would the guarantee have been sufficient to cover all costs (it would have come very close in 2008). Being guaranteed a profit at yields 80% of a historical average provided very strong signals to plant corn. While seeing guarantees of that level are uncommon, the amount of fixed costs left to cover is substantial and will likely require that some good things happen on the revenue side for farmers to turn a profit in 2016. Table 2 shows similar calculations for soybeans. 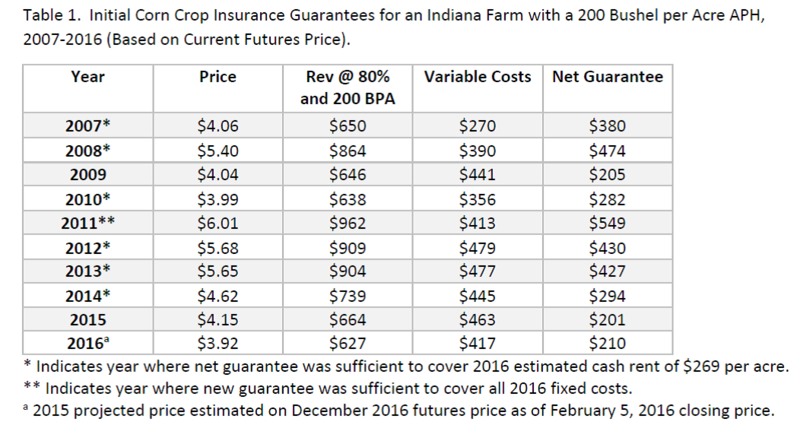 The 2016 net guarantee is basically the same as that offered by corn. Prior to the last three years the corn net guarantee exceeded soybeans. Since 2014 soybeans have been at least as attractive as corn from the net guarantee perspective. It should be noted that the levels shown in table 1 are for an acre of corn following soybeans, not continuous corn. 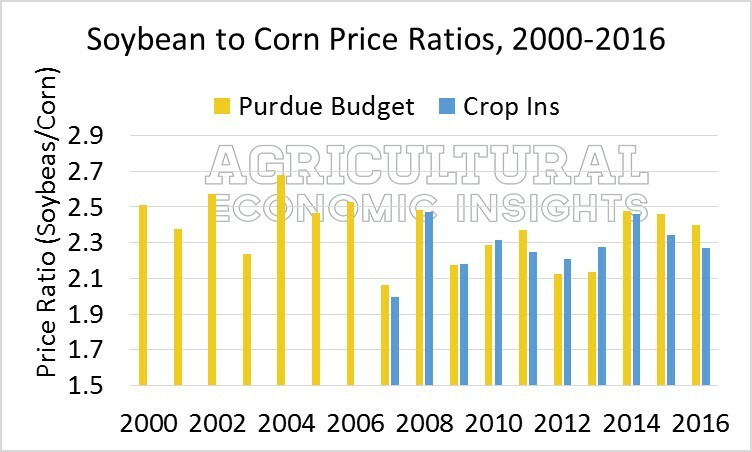 The Purdue budgets show a more negative budget picture for continuous corn. The budget situation appears to be basically the same as last year. All this would seem to point to a situation where soybeans are at least as favorable as corn, especially if one were to considering rotational benefits. What Do Price Ratios Suggest? Finally, we constructed a graph showing the soybean to corn price ratio since 2000. In this graph we have included the price values used in the Purdue budgets back to 2000 (in gold) and the crop insurance guaranteed price levels since 2007 (blue bars). The ratio of current crop insurance prices is the basically the same as that of 2013, a year when corn acreage started to decline and soybean acreage held relatively steady. This level of the ratio is close to the middle of the pack and a slight decline relative to the previous two years. Figure 1. Soybean to Corn Price Ratios, 2000-2016. The process of setting corn and soybean price levels for most of the U.S. is currently underway. At this point a few things are quite clear. First, insurance guarantees will not come anywhere close to covering the total costs of production for most farms. Second, unless prices rise considerably, they will not cover the cash rent on most farms. This means that most farms will have to see some revenue improvement to cover total costs. Depending upon local cash prices relative to guarantee levels (basis) the price improvement needed to cover total costs could be substantial. The soybean to corn price ratio is currently similar to recent years and does not seem to be signaling a strong shift toward or away from either crop. It will be important to monitor these levels closely in the coming weeks.